Thu., Feb. 15, 2018 7:00 p.m. The Report of the Truth and Reconciliation Commission contained 94 Calls to Action that laid out a path to start the process of reconciliation. Yet according to Pam Palmater, Canada’s approach to reconciliation has been more superficial than concrete. True reconciliation, she argues, won’t be found in land acknowledgments or Indigenizing public buildings with Indigenous artwork – it will only be found in the discomfort that comes with the exchange of land, wealth and power. 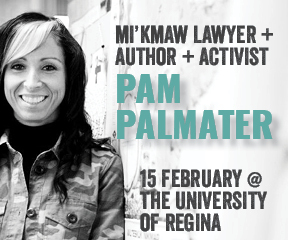 For more information about Pam Palmater, and this event, visit the Woodrow Lloyd Lecture website.